This page is mainly based on information from Bill and Barb Bigger and from John and Linda Bristol. Pegs and Jokers is a North American race game for four, six or eight players, using playing-cards to move pegs around a board. It is also sometimes known as Jokers and Pegs. 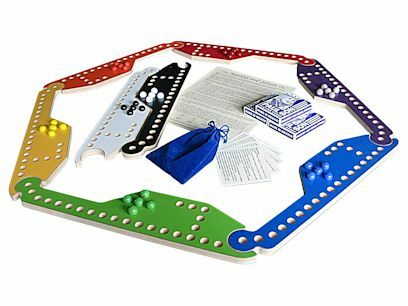 Some board designs use marbles instead of pegs as the playing pieces in which case it may be called Marbles and Jokers or Jokers and Marbles. Pegs and Jokers is clearly derived ultimately from the Indian race game Pachisi, a race game using dice for movement, pprobably via its American derivative Sorry!, in which pawns are moved according to cards drawn from a special deck. Pegs and Jokers is a partnership game played with standard playing-cards on boards that are generally home-made. It allows extra scope for strategy by giving players a choice of cards to play. Each player has five pegs, and the winners are the first team to move all their pegs from their START area to their HOME areas. The players are divided into two teams - two against two, three against three or four against four. They sit alternately - each player seated between two opponents. Standard decks of cards are used, with two jokers in each deck. Three decks (162 cards including 6 jokers) may be enough for up to six players: eight players should use four decks (216 cards including 8 jokers). Four players use a four-sided board; six players use a six-sided board; eight players use an eight-sided board - one side for each player, each associated with a different color. 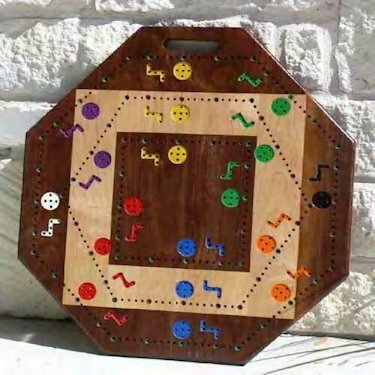 Each player has five pegs in the color that corresponds to the side of the board nearest to them. Each side of the board has a straight section of track 18 units long: there is a corner hole at each end, shared between two adjacent sides, and 17 holes between them. The 8th hole after the corner is the "come out" position for the pegs on that side, and next to it is the colored "start" area with five holes where the pegs of that color are stored at the start of the game. The 3rd hole after the corner is the "in-spot" for that color, and branching off at the "in-spot" is a colored private track of 5 holes, which is the "home" or "safe" area or "castle", where the pegs end their journey. The diagram below shows one side of the board. Board made by Bill Bigger following a design by Dave Vowells. the outer track, 6 use the middle track and 4 the inner track. together to accommodate any number of players. and white board sections can be used to expand to 8 players. Pegs and Jokers boards are available from Don Strenz Woodworking in Rochester, NY. Wizard Woodworks, based on Whidbey Island, WA supplies boards in sections for 6 or 8 player versions of Pegs and Jokers and Marbles and Jokers. Some people use colored golf tees as the pegs for this game. Others use the small colored plastic bulbs that fit into ceramic christmas trees - supplies of these bulbs can be obtained from Ceramic Art Space. Draw one card from the top of the face-down deck, so that you hold six cards. Play one card of your choice from your hand face up onto your discard pile. Move according to the power of the played card. If you have any card (except a joker) that allows you to move a peg, you must play such a card, even if the move is disadvantageous. However, if you have no cards (except jokers) that enable you to move you may discard one card of your choice without moving and draw a card to replace it. This ends your turn. Discarding without moving normally happens only at the start of the game, when a player has no aces or pictures to move any peg out of the start area. A player is never forced to play a joker: if you have no other move you may keep the joker and discard another card. All the pegs begin in their own start areas. From there they move to the neighbouring "come out" hole, and then around the board clockwise. On reaching its own "in-spot" a peg may take the branch into its safe "home" track. No peg may ever move into any start or home area other than its own. In the basic game, except in special circumstances described below, you may only move your own pegs. When a peg lands on an opponent's peg, the opponent's peg is immediately moved back to its start area. When a peg lands on a partner's peg, the partner's peg is immediately moved to its "in-spot", provided the partner does not already have a peg there. It is illegal to land on your partner's peg if that partner already has a peg on his or her own in-spot. In order to move your peg out of your start area, you must play a jack, queen, king, ace (to move it to its "come out" hole) or a joker (to move it to the hole occupied by a peg of a different color anywhere on the main track). When playing a 2, 3, 4, 5, 6, 9 or 10, you move one of your own pegs that is not in your start area forward that number of holes along the track. When playing an ace, you may either move one of your pegs from your start area to your "come out" hole, or move one of your pegs forward one hole. When playing a jack, queen or king you may either move one of your pegs from your start area to your "come out" hole, or move one of your pegs forward 10 holes. When playing an 8, you must move one of your pegs backwards 8 holes. When playing a 7, you may either move one of your pegs forward 7 holes, or split the 7 between two of your pegs, moving them 1 and 6, 2 and 5 or 3 and 4 holes forwards. Of course the split move can only be made if you have at least two pegs in play. When you play a joker, you move any one of your pegs (for example one in the start area) into a hole on the main track that is occupied by another player's peg, belonging either to a partner or to an opponent. This has the effect of sending that peg to its in-spot or start area respectively, as described above. A joker cannot be used to move to an empty hole, so if there are no pegs of any colour on the main track a joker cannot be played. You must always use the full value of the card played. For example when playing a 6 you must move a peg forward 6 holes, no less. If you play a 6 when you have a peg on your in-spot and all your other pegs in the start area, you must move your peg on along the main track, since there is not room in the home track for a move of 6. For a team to win the game, all its pegs must be in their respective home areas. Pegs move along the home tracks in the usual way. Since they cannot land on or pass over each other, the first peg to arrive must eventually be moved all the way to the end of the home track to leave room for the others, the second to the next space behind it and so on. "Backing in" to the home track is not allowed. In other words, pegs cannot turn into their home track while moving backwards. Also, pegs that are already in their home areas are not allowed to move backwards. However, it is legal to use a backward move on the main track as a means to get from start to home. For example: you could use a picture to move from the start area to "come-out"; use an 8 to move back 8 spaces to the corner (NOT into the home track); use a 4, 5, 6 or 7 to move forward into your home track. 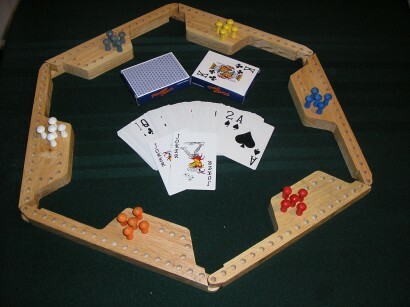 When, and only when, all five of your pegs are in the home (safe) position, occupying the five holes of your home track, you use your turn to move the pegs of your left-hand partner, if that player still has playable pegs. If left partner's pegs are also all home, you move the pegs of the next partner around the table who still has playable pegs. The first team that manages to get all its pegs into their respective home areas wins the game. 5 cards are dealt to each player as usual, but a turn consists of first playing a card to your discard pile, then moving a peg or pegs using the power of the played card, and finally drawing a card from the face down deck so that you have 5 cards again. So for each turn you have 5 cards to choose from rather than 6. Throughout the game, you may move any of the pegs belonging to your team (so for example any of 20 pegs in the 8-player game with 4 on each team). Therefore you may discard without moving only if you are unable to play a card (other than a joker) that moves any of your team's pegs. A peg cannot land on or pass over another peg of the same color. When playing a 9 you may either move one peg forward 9 holes, or split the 9 between two different pegs belonging to your team, moving one forward and the other backward - for example moving one peg 3 holes forward and another 6 holes backward. When using a 7 or 9 for a split move, you may move any two different pegs belonging to your team - either the same color or different colors. When you play a joker, if your team has any pegs in their start areas, you must move one of these pegs to replace any peg of a different color (belonging to either team) that is on the main track. If your team's start areas are all empty (but only in that case), you can move one of your team's pegs from anywhere on the main track to displace any peg of a different color on the main track. Here is a brief summary of the Arizona Rules in the form of a Word document. New players may find it useful to refer to this during their first few games. Brad Clark has provided a Spanish translation of the summary sheet. Naturally a 9, like a 7, can only be split if your team has at least two pegs in play. If your team only has one peg left that is not in its final home position, then 7 and 9 can only be used to move forward that number of holes. 8 spaces backward from the start takes you to the corner, which is a risky position to occupy, because you are 10 holes away from your neighbour's come-out hole. So after coming out of Start it is good to begin by moving 1, 2 or 3 spaces forwards. Then 8 spaces backwards will take you to or beyond your in-spot, putting you in a position to go home with less risk of being killed meanwhile by your right-hand opponent. If you move 4 or more spaces forward from your come-out hole, moving 8 backward is no longer useful, since this does not reach your in-spot. Your peg now becomes a runner - a peg to be sent on a journey around the board to harass opponents or move into partner's area. You can try to set up a home run by positioning your "runner" peg in teammate's come-out hole so that a peg coming out of START lands on your peg and sends it to its in-spot. Even better is the double play: a peg is left in its own come-out hole so that a teammate's arriving runner sends come-out peg directly to its in-spot. Then the next peg to come out of the start area sends the runner to its in-spot. Occasionally it is even possible to set up a longer "chain reaction" in which a series of different colored pegs displace each other in a single move. Also a 7 or 9 could be split to use one part to send a partner's peg to its in-spot and the other part to move that peg home. It is important to watch the board! When a player sees a runner approaching a start area, he should position a peg in the adjacent come-out hole to allow a home run. 10's and face cards move a peg 10 holes, and there are 64 of these "tens" in the four decks, making 10 the easiest distance to move. So when moving a runner to a partner's area or attacking opponents, it is good to lurk 10 spaces short of partner's come-out hole, or opponent's in-spot. Note also that a peg sitting 10 spaces away from its teammate's come-out happens also to be 8 spaces in front of its opponent's come-out, where it is (almost) safe from attack (since 8's move backwards). Another good place to wait is 3 spaces forward from a peg's come-out. This is 10 away from opponent's in-spot and also within reach of its own in-spot by moving backward 8. Also, when the team only has one peg left in the game and is approaching HOME, they should try to maneuver so the last several moves are 10's. Concentrating on moving into HOME. It is best to wait until an exact count card can be played to move all the way into Home (unless the peg is in imminent danger of being killed). Rely on your partners. Getting bound up: one or more pegs in HOME area but not all the way in. This is the Kiss of Death! Playing a joker too soon. Hold it until you can get a double or triple play or use it in the endgame to save your team from defeat. Don't be too eager to play it! Attacking an opponent instead of putting a teammate into a scoring position. An opponent sent to START is after all only two moves from his home entry space (a face card plus an 8 or 9). In the endgame: playing high cards so that the team is too close to enter HOME on an exact count. If you can't go all the way HOME, play your smallest card and give your teammates more chances to enter HOME. As in most card games, players are not allowed to reveal the cards in their hands to partners or opponents. It is sometimes very tempting to offer advice or suggest moves to your partners, or to seek advice when it is your move, especially when playing by the Arizona rules which allow players to move any of their team's pegs. This kind of table talk almost inevitably gives away information about the cards held by the players, and is not allowed in games between experienced players. When teaching the game to beginners, this rule may be relaxed to allow possible moves to be discussed by the team. In this case, when discussing moves, players should do their best to avoid exchanging information about the cards that they hold. As in the basic game, a turn consists of first drawing, then playing one of your six cards and moving as appropriate. As in the basic game, you can only move your own pegs until your last peg is home. After that you move the pegs of the partner nearest to your left. You can use a split move to take your last peg home and move your left hand partner's peg with the remainder. As in the basic game, a joker moves one or your own pegs from anywhere on the board to any hole on the main track that is occupied by a peg. With an ace you can come out, or move one space forwards, or move one space backwards, or move 11 spaces forwards. Sevens can be split to move two pegs forwards, as in the basic game. Nines can be split to move one peg forwards and a different peg backwards, as in the Arizona rules, but they must both be your own pegs (until all your pegs are home). Tens must be split between two different pegs. These can be any two pegs on the board - your own, your partner's or your opponent's, except that opponents' pegs can only be moved on the main track, not if they are within their safe area or castle. These pegs can both move forwards, both backwards or one forwards and one backwards (but as usual backwards moves are only allowed on the main track, not into, within or out of a peg's safe area). For example you could move two of your team's pegs from their come out spots back 5 to their in spots. But you cannot move a single peg 10 holes. If you "hit" one of your team's pegs it goes to its in spot, even if you hit it using an opponent's peg; if you hit an opponent's peg it goes to back its start area, even if you hit it using a peg of another color from the same team. If you are unable to move - for example all your pegs are at start or in your castle and after drawing you have no "come out" card (A, K, Q, J, joker), no ten and no card small enough to move within your castle - you discard a card without moving. This is known as "counting". If this happens on three consecutive turns, then on the third turn, after discarding any card you must move one of your pegs to your "come out" hole for free. Note that counting applies to a player, not a team: if more than one player in a team is unable to move they each count separately (even if they are both moving the same pegs because one of them has already brought all their pegs home). Also on the third turn you have the privilege of discarding any card and coming out free even if you drew a "come out" card. Note that normally you cannot count if you hold a ten, since this card can move any two pegs (with the exception of pegs at start or in their final positions, and opponents' pegs in their safe areas). Some play that when counting you do not come out free until your fourth turn. Note that if while counting you have a peg that is in your castle but not all the way in, and you draw a small card that can move this peg, you must move it on that turn, and restart your count from 1 again on your next turn if once again unable to move. According to the rule sheet distributed by Wizard Woodworks a two is a special card that allows the player either to move forward 2 or to exchange the poistions of any two different coloured marbles/pegs that are on the main track (not in the start or home areas). Other rules are in the basic game, except that as in the Arizona version players first play a card, then move and draw a replacement card at the end of their turn, and nines can be split, moving one peg/marble forward and another backward. Eileen Becker from Alaska describes a variation in which a 10 can be used to move a peg either forward 10 spaces or backward 1 space. Apart from this the game is similar to the basic game described on this page, but using the "counting rule" from the North Carolina rules, allowing a player to come out with any card on the fourth turn after being stuck for three turns. Only 3 cards each are dealt instead of 5. A peg cannot be moved forwards along the main track past its in-spot. When moving forwards it must turn into its home track when it reaches the in-spot and if there is not enough clear space there for the value of the played card to be fully used, that peg cannot be moved on that turn. Ian Terry describes the Bluffing Joker variant, played in Florida, in which the basic rules are identical to the regular game, except that all cards played are played face-down. The player may declare the face-down card to be whatever they desire. Before the player moves their piece, the opposing team has the chance to doubt the player's declaration. The next opponent player clockwise from the player whose turn it is has the option of doubting first. If no doubt is raised by the first opponent, it passes to the next opponent, and so on around the table. If no doubts are raised, the peg is moved and the card is discarded, still face down, thus ending the turn. If a bluff is doubted successfully, the team that doubted successfully chooses one of the bluffing player's pegs to send back to start and ​the turn ends immediately. If the bluffing player has no pegs out of start yet, the player that doubted successfully has the option to take an extra turn on their next chance to play. Here are archive copies of the former Pegs and Jokers page of the D'Antiques Board Games Database which included rules of the game.